This study is the first approach to evaluate the diversity of bacterial β-glucosidase-encoding gene sequences, aiming to identify the main environmental factors structuring bacterial β-glucosidase genetic diversity in semiarid soils. Two agricultural management systems, soils under spontaneous cover vegetation vs. noncovered herbicide-treated soils, were tested. The weed biomass generated in the former was estimated around 2,600 kg ha−1 year−1, whereas leaves and root exudates from olive trees were the only input of C biomass in the latter. Dendrograms generated from polymerase chain reaction–denaturing gradient gel electrophoresis profiles of bacterial β-glucosidase-encoding genes revealed two clusters determined by soil treatment and sharing <20 % similarity. The sequences of a total of 59 DNA fragments, representing 39 operational taxonomic units, were successfully determined. The Proteobacteria phylum clearly dominated all the soil samples, but representatives of Chloroflexi, Deinococci, Actinobacteria, Thermotogae, and Firmicutes class were also detected. Management strategies favoring the presence of spontaneous vegetation determined a higher genetic diversity of β-glucosidase-encoding genes of soil bacteria. However, since there is little information of β-glucosidase gene sequences available in databases, it is difficult to establish particular relationships between bacterial networks for C degradation and land use. 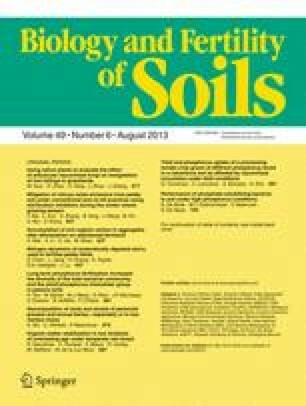 Results from canonical correspondence analysis indicated that bacterial metabolic networks for oligomeric C substrates utilization were affected by the physicochemical properties of the soil; the uppermost 10 cm of covered soil clustered together and were positively correlated with some chemical properties related to soil fertility, whereas less influence of soil texture was observed for the deeper layers of bare soils. Beatriz Moreno and Rosa Cañizares contributed equally to this work. This work was supported by ERDF-cofinanced grant CGL2009-07907 from the Spanish Ministry of Science of Innovation. R. Cañizares is supported by the JAE-CSIC predoctoral program. We also thank J. Castro for providing some chemical and physical data for the soils used in this study and the anonymous reviewers comments that greatly improved the manuscript. The chromatographic analyses were made at the Scientific Instrumentation Service, Estación Experimental del Zaidín, CSIC, Granada, Spain.